It's difficult to explain exactly why these two basic little tops took up as much time and brain space as they did, but I'll try. It's definitely not a fault with the drafting of this pattern, however I have a theory that it's actually the simplest garments that are the hardest to fit, because when there are no frills, flounces, gathers or any other busyness, there's nowhere to hide any wonkiness! Towards the end of last summer, I was feeling a desire for some woven tank tops. My anchor La Brune top had convinced me that the world wouldn't come to a stand still if I exposed my upper arms, and actually it feels really nice to wear a sleeveless garment in hot weather (who knew?!). 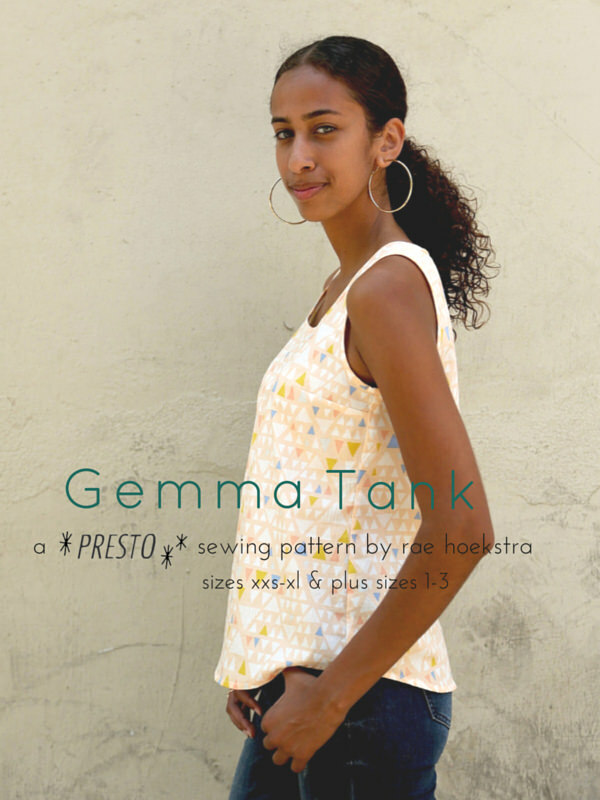 I spent ages going back and forth between Made by Rae's Gemma tank pattern, Wiksten's tank pattern and the no-longer-available Tiny pocket tank pattern by Grainline Studio. By the time I selected my #2018makenine plans, I had finally fallen down on the side of the Gemma tank because I felt the bust darts are a nice addition for preventing this type of garment from looking too shapeless. A quick note about the bindings. One of the things that make this a speedy, simple pattern to make is that the neck and armholes are bound with bias binding rather than being finished with facings. Rae has helpfully detailed three methods for using bias binding on her blog. What she calls the 'French method' is by far my favourite, and is what I have used on both my versions that you see in this post. However, because this method flips the binding to the inside of the garment, rather than encasing the raw edge with no folding, as the other two methods do, the neck and armholes become wider, and the shoulder strap gets narrower. To combat this, I've added a little to my neck and armholes. However, my bra straps do peek out a tiny bit from time to time, so I may increase my addition to the armhole around my shoulder for future versions. This pattern helpfully comes with two different front pieces for different cup sizes: A/B and C/D. Although you'd never guess from looking at me with clothes on, I actually wear a D-cup bra. However, pregnancies and breast feeding have, umm, 'redistributed' my fullness and I chose to go with the front piece designed for the A/B cups. I also graded between the Small around the bust, out to the Medium for the waist and hips, which is my usual adjustment. I toiled this up in some thin cotton and the result was ok, but there was far too much fabric around the lower back area. I realised that I'd forgotten to pinch out some of the length to account for my short waisted-ness, so I did that and made another version in gingham left over from this Tova dress. I was hoping that it'd end up wearable, if not perfect, but I should have dug deep and found the patience to make a second toile in not-so-great fabric first because the gingham version did NOT end up wearable. There was still a whole load of fabric bunched up at the lower back that the short waist adjustment didn't solve. It was time to accept something that I'd been avoiding admitting for a while: I have a sway back issue going on. I spent a bunch of time researching sway back adjustments, and eventually came across this excellent Youtube video by Alexandra Morgan which shows three methods clearly and thoroughly. I went with the method that requires you to make a centre back seam rather than cutting out the back piece on the fold. I did this for two reasons; firstly, it made more sense to me to have a CB seam for achieving an adjustment that thoroughly deals with the sway back problem, and secondly, the next piece of fabric in my stash that I had my eye on for a Gemma tank was quite small, so I thought that cutting the back of the garment in two pieces rather than on the fold was going to be necessary anyhow. This time, I did managed to summon up the patience to make a toile before ruining another piece of nice fabric. I could see that the sway back adjustment had definitely improved things, but it was far from perfect. Because I didn't have anyone around to help with the tricky business of fixing a fit issue around the back, I'd had to guess the position and amount of the adjustment I was making. After that toile, I went back to the pattern and pinched a tiny bit more out of the sway back adjustment then got out the chicken fabric. This fabric is another of those pieces that seemed to have magically appeared in my stash, as I have no memory of how or when it got in there. Weirdly enough, I had another, larger, piece of African wax fabric with this chicken print before that I made into a dress for my best friend almost a decade ago! The previous piece was some kind of synthetic or synthetic blend (which contributed to it's demise when it met with a hot iron), but this smaller, orangey-er piece is definitely 100% cotton. I struggled to make the most of the print placement because of the amount I had to work with, and I promise you the back print placement looked better when it was the full length version of this garment. Anyways, seeing as I didn't take photos of any of these steps you'll have to believe me that this chicken version was definitely an improvement, fit-wise, on the previous sway-back adjusted toile. I knew that this fairly crisp fabric was stretching the limits of the suitability of cotton for this pattern, and although I seemed to finally be rid of much of the excess fabric around my lower back, every time I bent down or forward, or lifted my arms, the lower back section kept kind of 'sitting' on my upper bum and I'd have to yank it back down again. This quickly became tiresome, and I decided that the only way to salvage this chicken version as something I would actually want to wear was to hack the bottom off and make it a boxy crop top. I tell you now that I am NOT a crop top kind of woman. However, the denim sweet shorts that I've wearing a lot this summer are pretty high waisted, so I felt confident that a cropped Gemma tank would have a mate to form an outfit with. Before I hacked the bottom off the chicken version, my mum came to visit and I got her to have a look at it on me and get her assistance. Together, we were able to take any residual lessons from it that could be gleaned before I went at it with the scissors. She got busy with the pins and worked out that just a tiny bit more was needed to be taken out in the sway back adjustment, and worked out the precise position for where it should come out. We also figured out together that my sway back adjustment was swinging the side seam backwards, and by slicing through the seam and allowing it to open up, we worked out that 1cm needed to be added to the side seam of the back piece from the hem up to nothing around the upper hip area. I managed to complete this Gemma just in time for the weather to turn and for no-sleeves to stop being an option, so I haven't had a chance to give it a proper test run. From these photos it looks like even more could be pinched out of the sway back and/or I could give myself a bit more at the side seams over the hips. However, IMO it doesn't look bad, especially from the front, and in a softer, drapier fabric like the kind used in the Made by Rae image towards the top of this post, you might not even see a need for further adjustment. Either way, I'm done with tweaking, or even thinking about, this pattern for at least six months. What did please me very much though, is that not only did I squeeze this top out of 1 metre of fabric along with self-made bias, but I also was able to make a pair of shorts for Frankie with the remains. I find few things more satisfying. In case you're wondering, I used the Made Everyday with Dana Kid shorts pattern, size 3 (Frankie will be 2 years old next summer, however, I find this pattern runs a bit small). I also added labels to both the tank and shorts using some cute woven ribbon with birds that was the perfect theme and colours for my fabric. I was kindly given a length of this and some other ribbons by Textile Garden a number of years ago. If you're in the market for some sweet woven ribbon, then you should head over there as they have a great selection. Wow! You’re amazing. I’m super impressed with your perseverance. Hopefully you have something you can use over and over now!! I do find it interesting what you said about the simplest garments being more difficult to fit; that has indeed been the case for me in drafting them as well. There’s nowhere for those fit wrinkles to hide when you have such a blank slate. Of course conversely it’s quicker tomato’s a toile. Thanks for sharing your play-by-play!! Super fun to read about and love your versions so far!!! I really like the feather version! Lately i’ve been in to fitting more and more and I recognize your ‘simpeler garment, more diffucult to fit’ issue. This sometimes makes me avoid these simple garments, un like you!! Ah yes! The deceptively simple little tank - I think that sleeveless tops are an absolute nightmare to fit. I get all sorts of gaping armhole issues. Thanks for the really useful post - that video looks really good for sorting out sway back too. Although I'm actually comtemplating just drafting my own from scratch and then I can nail that fit. Love the feather fabric and the perfect curved hem! Top marks for perseverance too! This is very true, that simple things are hard! Nowhere to hide! Also, I think you'll find that no matter what the fit, a fabric that grabs at the bottom garment fabric will never sit nicely with wearing. Dammit. A wee bit of satiny lining in the lower back can solve that. I am surprised that the pattern doesn't have different lines for the "french" bias and the others. It's one of those things I have to always remind my students, and myself hehe. BTW love them all, especially the feather one! Man. I miss my chicken dress. Terrible iron mishap. I’ve just found your review of this Rae top and my first thought was ‘thank goodness it’s not just me having fitting issues with it’. I spent ages trying to get a good fit with all the issues you described happening. In the end I gave up and went back to my trusty NewLook basic top pattern, bought years ago. No fitting issues, back seam, inner facing to hold the neck in place all good. I do like your final top, it looks great.